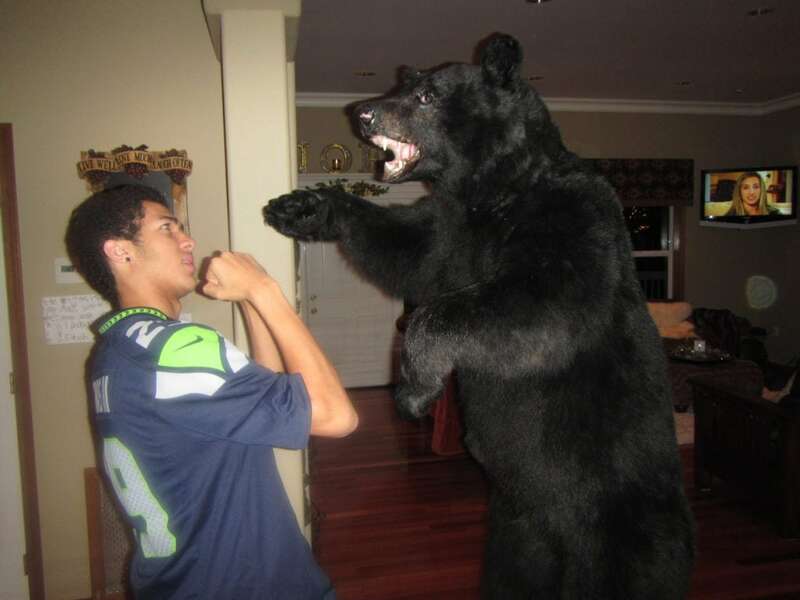 Malek at a past Thanksgiving pretending to fight the bear. He was always making somebody laugh! Happy Thanksgiving to you and all of your families! Jen and I will be taking the day away from deals to spend time with our families today, and we hope that you are able to do so too! We do like to take this opportunity to wish you all well, and a very special day. This is the place I would generally share something nice about being thankful. This year is different though. Not because I am not thankful, but because we have been faced with tragedy upon tragedy in these past two months. My son was tragically killed on October 2nd. That day will forever be burned into my memory, like an awful nightmare that plays over and over. Just over a week after that our church was burned down, and then the day before what would have been my sons 19th birthday, we learned that my father in law was shot and killed during a welfare visit. He was not handling my sons death well, and that ended tragically for my family too. I only share these situations with you all, so that when I share about being grateful you will understand where I am coming from. This Thanksgiving will be different for my family and I. It will be the most difficult and painful Thanksgiving I have had to endure in my life. It will also be the Thanksgiving that I am more grateful than I have ever been in my life. I am compelled to ponder the first Thanksgiving, when the Pilgrim Settlers had lost close to half those that came over on the Mayflower with them. With that kind of loss, I imagine that the intimate sting of death had touched every one of them that was left. Yet, they still found reason to celebrate, for three whole days, the fact that they were thankful for their blessings. It is the first we will be spending without our precious son Malek here on earth. If I am honest with you all, I will have to tell you that it has been brutal. I do not think there has been a day that has gone by since Malek was killed that I have not cried. I am truly heartbroken. But I do not despair. The pain I feel in missing my son, is a physical, ongoing, deep ache inside my chest, that I cannot seem to get any relief from. Yet, even in the midst of the darkest days of my life, I find so much to be thankful for. I feel deep pain, but on the other side of that coin is that I feel deep gratitude too. Imagine that, our hearts are created to be able to sustain loss so deep there are not words for it, yet continue to be immersed in gratitude, all at the same time. So this Thanksgiving I will choose to set my heart upon what I am grateful for. This is how I will get through my first Thanksgiving without my son here with me. It has been my faith in Jesus that has gotten me through, so please grant me the leeway to share from my heart today – as my emotions are still so raw, its the only way I know how to share with you all these deeply personal things. I am so very grateful for the outpouring of love and support we have received from so many, including many of you. I am very grateful for Jen, and her kind and giving heart. I am grateful for how loved my son was for his 18 years on this earth. I have been so blessed by seeing how many people loved him, continue to mourn him, and the ways in which his death has impacted so many. I am so grateful that I had 18 precious years with that boy. That I got to see him graduate, and get a license, and start that journey to independence. His death came as a traumatic shock to us, but I remind myself that it was not a shock to God. God is not bound by time, and knew Maleks day of death the same way He knew his day of birth (Psalms 139:16). I am grateful for the many things I have learned from my sons example, as I have spent time reflecting on his life. He has inspired me to love, without judgement or boundaries. He has inspired me to be kind whenever possible. To talk to people with respect. Teachers shared with me how he was often the “first friend” of new kids at school. I cannot even remember how many young people introduced themselves to me as Maleks best friend. He had a way of making people feel special, and for that I am so grateful, and will strive to do better myself. I am very grateful that I had those last minutes with Malek the night he left our house for the last time. I am so glad I got that one last time to tell him I loved him, for him to play with his sisters briefly, and share with me about how he talked to God often. I am grateful we were at church, surrounded by good friends when we got the news. I am grateful for the way those women stood by my side as I wailed, took my children to the movies while we worked out our own trauma and took the time to figure out how we were going to tell them. I am grateful for friends who walked out true love by taking on the task of all the funeral home arrangements, burial arrangements and funeral planning for us. I am grateful for the generosity of friends, family and community who supported us through the unexpected costs that come with the unexpected loss of a child. It is not lost on me that a time of such deep loss, we also experienced great gain in people showing up for us. My husband, myself and my two girls are all changed in ways I cannot explain. There is the before October 2nd version of us, and the after. We have crossed a line that cannot be uncrossed. We know things I wish we had no idea about. We have seen things that I could not have imagined having to gaze upon. Although I wish I could go back to when my son was with us, I do not wish that I would “un-know” some of the things our eyes have been opened to in this process. I am a more compassionate person then I was before. I understand grace in a deeper way then I ever did. My heart is softened to the suffering of others. Its not so easy to turn a blind eye to things as it was before. Those are all things I am grateful for. And most of all, I am grateful for the grace of God. I have never been more grateful for Gods gift of grace, given to us through His sacrifice of His son Jesus on the cross. I can know that I will see my son in heaven again because I know he had faith in that sacrifice too. I am so grateful for that hope that I have. Knowing that my son is not gone, but waiting for us in heaven, brings me the most comfort. I believe the Lord was with him at the tree he was crushed by, and held him there when I could not. I imagine that Malek, who loved all animals, is now running with creatures we have never seen on earth. I imagine lush greens like none we have ever seen. I imagine him meeting Jesus face to face, giving assignment to angels, and dancing before the Lord. I imagine joy and peace are his companions all the time now. I image the version of my son that is everything that is him, yet free from the struggles we go through here on earth. The death of my son, has drawn me closer to heaven. I obsessively think about things I had not put much thought into before this, and they are good things. Death takes 100% of us, at one point or another, so I surprise myself that I had put such little thought into it prior. I am grateful that this world is not my ultimate home, and think with great thanksgiving what that joyous day in heaven will be like when we are reunited once again. To be honest, I could go on regarding so much I still have to be grateful for. I just want to encourage you all that even in the midst of painful suffering we can experience gratitude and and thanksgiving. I pray you all have a day filled with many blessings this Thanksgiving. We will be back online later this evening with more great deals, and starting very early all day tomorrow! If you have stopped by looking for deals, we are featuring Black Friday, so be sure to follow those pages.